CEFA is a specialized investment firm with the experience, process, resources and credibility to handle your investment portfolio. Closed-End Fund Advisors ("CEFA") has 55 combined years of industry experience, and we are active in the Closed-End Fund Association, The CFA Institute and the Richmond Association for Business Economics. We have 27 years of closed-end fund board experience and our senior portfolio manager, George Scott, is the co-author of the only hardback book on the industry. 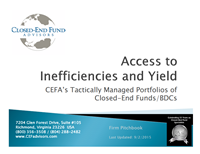 CEFA publishes a leading industry periodical and provides a weekly closed-end fund data service. Having access to financial research, data and professional contacts, CEFA is on the leading edge of industry developments. The Scott Letter: Closed-End Fund Report publishes our primary research, including portfolio manager interviews and stays in touch with the fundamental changes in the global closed-end fund industry. CEFA's Closed-End Fund Universe report offers a comprehensive weekly data report covering the complete list of 600+ available closed-end funds with 100+ data points tracked on 77 unique subgroups. Principals of CEFA are regularly contacted by the financial press for input and commentary on global investments and closed-end fund issues. We also have access to the majority of closed-end fund portfolio management teams in order to stay in touch with changes in their investment outlook. As discretionary, fee-based investment managers, CEFA tracks client performance for its portfolio models as well as comparable indices to measure our absolute and relative performance. All portfolios are rebalanced regularly and are monitored almost daily in order to ensure that asset allocations stay within set percentages and that each position is the best choice for the underlying investment objective on relative and historical bases. 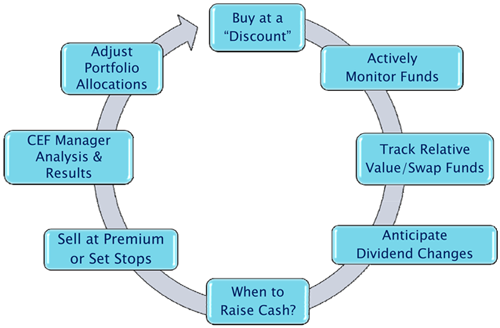 We are active managers making changes to our portfolio models weekly as needed. With the benefits of separately managed accounts, CEFA can work on behalf of both individual and institutional investors (with account variances up to 5%) of a portfolio model, as well as monitor tax-sensitivity. We are passionate about our work, offering clients the same investment strategies that we use in our own portfolios. Client interests are ALWAYS favored over our own. As an investor with our firm, there are no front-end or back-end fees. The first quarterly fee is always prorated for only the time we actively work on a portfolio. All of our custodians allow on-line access to clients in order that they may view their portfolios as frequently as they desire. CEFA is one of the few investment firms that publishes their model portfolio performances monthly. Interested? Contact us today for more information and our brochure! For more information, download our firm's profile presentation and our ADV Part 2. *Disclosures: The net returns presented above for all of CEFA's composites were calculated on a time-weighted return basis. All dividends, interest and income, realized and unrealized gains and losses, brokerage and custodial fees are fully reflected. CEFA advisory fees are fully detailed in its ADV Part 2. CEFA composites include all actual fee-paying and non-fee-paying, fully discretionary accounts in this investment strategy that have been under CEFA management for at least three months. Diversified Growth and Growth & Income Models: As of December 31, 2014, the percentage of non-fee-paying CEFA accounts in the Growth strategy was 11% and was 0% in the Growth & Income strategy. The inception date of this composite is December 31, 1998. As of January 1, 2014, these accounts are managed solely by John Cole Scott; he and CEFA founder, George Cole Scott, jointly managed the accounts from June 30, 2009 to December 31, 2013; and George Cole Scott solely managed the accounts from their inception to June 30, 2009. Hybrid Income Model: As of December 31, 2014, the percentage of non-fee-paying CEFA accounts in this strategy was 0%. John Cole Scott has managed the accounts in this model since its inception on November 30, 2006.
International Opportunity: As of December 31, 2014, the percentage of non-fee-paying CEFA accounts in this strategy was 0%. The inception date of the International Equity composite (formerly called International Equity and International REIT) is October 31, 2002. As of January 1, 2014, these accounts are managed solely by John Cole Scott; he and CEFA founder, George Cole Scott, jointly managed the accounts from December 31, 2010 to December 31, 2014; and George Cole Scott solely managed the accounts from its inception to December 31, 2010. Foundation Balanced, Conservative Diversified and Special Opportunities: As of December 31, 2014, the percentage of non-fee-payment CEFA accounts in this strategy is 0%. John Cole Scott has managed the accounts in these models since their inception: August 31, 2009, April 30, 2009 and May 31, 2013, respectively. Managed Municipal Bond Closed-End Funds: As of December 31, 2014, the percentage of non-fee-paying CEFA accounts in this strategy is 0%. John Cole Scott has managed the accounts in this model since its inception on July 31, 2014.
Business Development Company ("BDC"): As of December 31, 2014, the percentage of non-fee-paying CEFA accounts in this strategy is 0%. John Cole Scott has managed the accounts in this model since its inception on December 31, 2014. The results for individual accounts at different periods may vary. Investors should not rely on prior performance as a reliable indication of future results. These figures are unaudited and may be subject to change. The information provided should not be considered as a recommendation to buy or sell any particular security outside of a managed account. CEFA reserves the right to modify its current investment strategies and techniques based on changing market conditions or client needs. The S&P 500 and DJ World Stock (excluding U.S.) indices were calculated using total return analysis with dividends reinvested. These indexes have not been selected to represent an appropriate benchmark to compare an client's performance but rather is disclosed to allow for comparison of the client's performance to that of a certain well-known and widely recognized index. Be sure to tell friends, family, colleagues and your financial advisor about this free and valuable investment newsletter.